growth mindset | Red Said What? Nort was born from a doodle sketched on our CrossFit gym’s white board by Coach Will who happens to be part Physical Education teacher, part aspiring Games Athlete and part Tarzan upon hearing the 9:30am crew kvetch about the workout of the day. While the teaching coach warmed up the class, Will moseyed over to the board, picked up an Expo marker and outlined a chair frame. “Looks like a rocking chair,” I said. Schooled by young Tarzan, we shut our middle-aged mouths and carried on. But Will’s rocking chair analogy stuck. I took a picture of his masterpiece and brought it home. Negative fumes fueled by complaints, self-doubt, whining, tantrums and profanity pollute my house. And the smog is thickening. Bubbe often works himself up into a frenzy of I can’t, I’m stupid and There’s nothing I can do I’m just a negative person when challenged by school, home or relationship expectations. Skootch, who prefers to grin through an existence void of conflict will lash out as a first line of defense when work gets hard or he feels wronged. While a 7 year-old hollering, “Shut the hell off you idiot!” can be comical, it doesn’t benefit anyone. Mac who prefers to laugh and embrace a positive outlook still beats himself up when he makes a mistake. I’m far from a stellar role model. Negativity was thrown at me as a child. Mix that with an upbringing tainted by mental illness and trauma and it’s no wonder self-deprecation and snark come easier than silver linings. 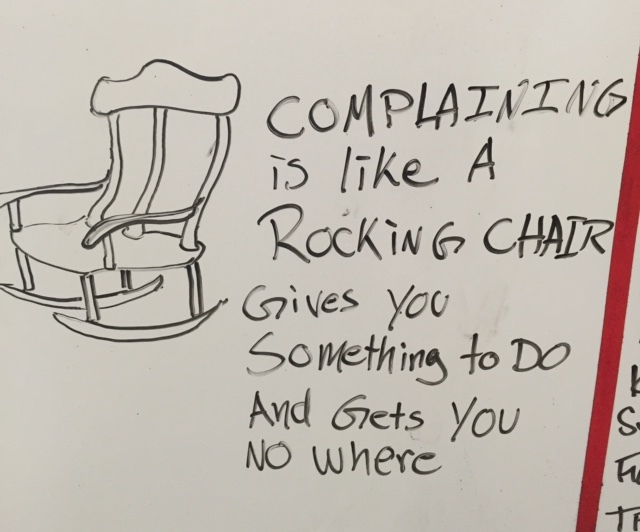 While committed to breaking the cycle, chasing my children shouting “Rocking Chair” doesn’t encourage self-awareness or offer strategies to promote positive thinking. 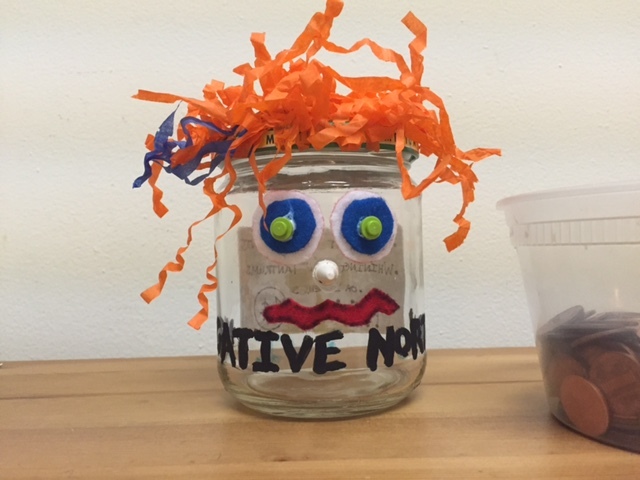 Dr. Carol Dweck, author and developmental, social and personality psychologist coined the phrase growth mindset or “the belief you can develop your abilities.” With the understanding that the brain is a muscle we can train and in the spirit of Dr. Dweck’s work, I crafted Negative Norton. Each time any one of us exhibits the above behaviors, we must feed Norton a penny. I kept the rate to one cent to avoid going broke and for logistical ease, emptied the pennies from our piggy banks in advance and stored them next to our new house guest. Bubbe came up with a tangible one. He suggested if Nort eats less than 20 pennies in the first week, our family would do something fun together. 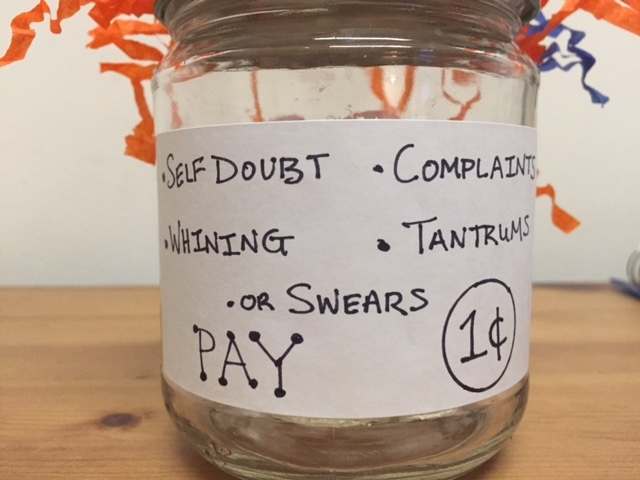 If our negative behavior declined over time, we would challenge ourselves by reducing the penny cap. Within 90 minutes of Negative Norton’s activation, we fed him 4 times. Our family has been feeding Nort for 5 days now. 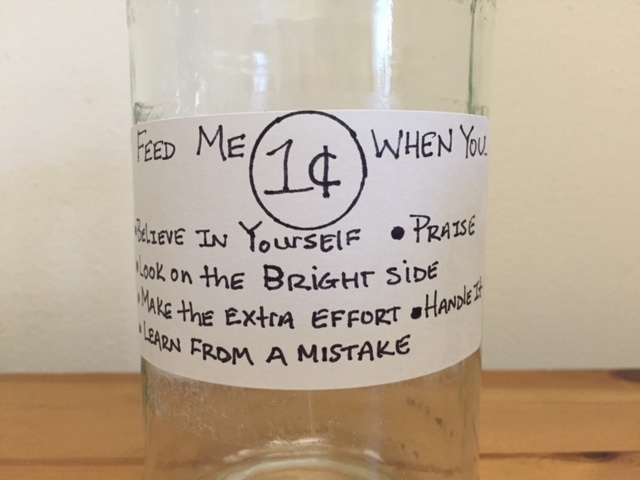 There are 15 pennies in the jar. On average, he scarfs down 2 coins a day. Mac and I like having Negative Norton around. The boys want him to move out. Skootch equates “pennying up” with getting in trouble. “My friends don’t have a Negative Norton. Everybody has tantrums. Bad idea.” He wants Nort to smile and get the money anytime we do something good instead. He’s onto something. Still, our current system is making an impact. “I miss saying bad words,” he recently said. Negative Norton will take up residence on our coffee table for now. There will always be pennies in his jar. The key is to feed him less. More self-aware, our family is ready for phase two: strategy application. Time to get cracking on Nort’s roommate; smiling, penny loving Positive Pete.